All of the amazing hacks people have unleashed on Kinect to do crazy, weird, awesome stuff? It's about to get more insane, because it won't just be hackers doing the noodling. Microsoft's going to release a full SDK for Kinect on Windows 7 that lets developers access more than just the messy raw data people have been extracting, allowing devs to start coming up with even wilder, more sophisticated Kinect apps. The goal of the new SDK, coming this spring, is to "meet the needs of higher-level people who don't care how the camera works" but just have an amazing idea of what they wanna do with Kinect, says Microsoft's head brain Craig Mundie. The SDK will provide drivers and libraries that live above the raw data, allowing devs to fully tap the RGB camera, mic array, and motors that move Kinect around. Initially, it'll be for enthusiasts and academics, not people who'll be making money off their Kinect apps—but there's a plan for those folks in the future. Every year about this time, Craig Mundie, Microsoft's chief research and strategy officer, holds an intimate gathering to discuss the company's vision for the future: just Craig, a handful of Microsoft thinkers and select media convening for a lively show-and-tell discussion called TechForum. I'll have more to share here tomorrow about the prototypes shown and topics discussed during the course of the day. This morning, Craig and Don Mattrick, president, Interactive Entertainment Business (IEB), announced plans to release a non-commercial Kinect for Windows Software Development Kit, or SDK, this spring. The community that has blossomed since the launch of Kinect for Xbox 360 in November shows the breadth of invention and depth of imagination possible when people have access to ground-breaking technology. Already, researchers, academics and enthusiasts are thinking through what's next in natural and intuitive technology. For example, in January I mentioned Craig's talk at the Cleveland Clinic, where he highlighted students at the University of Washington's Biorobotics Lab using Kinect with a commercially available PHANTOM Omni Haptic Device to explore how robotic surgery could be enhanced by incorporating the sense of feel. 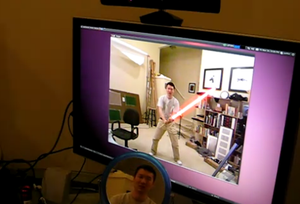 The Kinect for Windows SDK is being developed and released by Microsoft Research (MSR) in collaboration with IEB. It will be available this spring as a free download, and will give academic researchers and enthusiasts access to key pieces of the Kinect system-such as the audio technology, system application programming interfaces and direct control of the Kinect sensor itself. The possibilities are endless. Natural and intuitive technologies such as Kinect can be more than just a great platform for gaming and entertainment. They open up enormous opportunities across a wide variety of scenarios, including addressing societal issues in areas such as healthcare and education. Here's to spring 2011 and what's next in natural user interface technologies.